Posted on June 10, 2018 by wjastorePosted in Society, US Military, US PoliticsTagged activism, athletes, corporate sports, Howard Bryant, military, patriotism, protest, sports, taking a knee, The Heritage. I’m not a sports fan, but the most important impetus in this sports militarization is to aid recruiting, isn’t it? The military is expanding while facing a shrinking pool of eligible recruits, since over seventy percent of America’s youth is unfit for military service for various reasons. This has led to waivers and excessive promises that can’t be kept, and also expensive bonuses for young people to sign up and then sit around the barracks reflecting on the promises they were given. The “bread and circuses” with the war-based national anthem and fighter flyovers are great shows also designed to distract ordinary folks from their mundane lives in the midst of rampant crime, homelessness, unemployment, fake news and ridiculous politicians. After all, the USA has been a national security state since at least 1947, a place where Job-1 for the government is to keep us safe, especially now with the worsening of relations with our neighbors to the north and south, as well as the presence of dastardly “terrorists” in Africa and such far away places, not to mention the “revisionists” in Russia and China. A few weeks ago, in a familiar routine, the Marine recruiters came to our high school. They bring a chin up bar. They bring lots of swag–water bottles, key chains, t-shirts. The boys stand in a circle and alternate chanting encouragement or derision as the gym rats pound out pull-ups. The girls stand in a bigger circle and watch. I don’t pretend to know what the girls are thinking, but I do know that for some of these boys, this is the first time girls are noticing them. Many women serve in the armed forces, but you wouldn’t know it from this display–it’s a testoterone-fest. The Marines award t-shirts and fist bumps to those who can do lots of pull-ups– as if modern warfare depended primarily on athletic ability. This scene plays out in high schools around the country– although probably not so much in Newton, MA or Palo Alto, CA. They also bring a few boys who, just a year or two ago were ordinary high school students– not necessarily the best students and probably not the best athletes, either. They are now transformed into American “heroes” complete with military bearing and the best looking dress uniform in the armed forces. I feel profoundly uncomfortable with this atmosphere. It feels like an exploitation of adolescence, to take advantage of all those hormones coursing around– all that shaky body image and self doubt–to offer transformation into an object of worship. High school boys feel ordinary, perhaps even invisible–by junior year it’s obvious that professional sports is not in their future. If you can’t be Tom Brady, you can be the next best thing– an American hero who will be honored at half-time. Indeed, as you point out, “War is not a sport; it’s not entertainment; it’s not fun. And blurring the lines between sport and war is not in the best interests of our youth, who should not be sold on military service based on stadium pageantry or team marketing.” This style of high school recruiting is in the same category and should end. Yes. Exploitation is the right word. When I was in Pennsylvania, I remember military display vans at the Little League World Series. Kids played military-related video games in these vans. I suppose they were too young to sign up at 12, but the military was looking ahead to high school and generating that spark of interest in all the “cool” toys the military has. Junior ROTC and military recruitment in high school: I would forbid both. If people want to send their kids to military schools, that’s another matter. Trump apparently attended one for “discipline,” and look what he achieved … what a man he’s become. >What a shame that this can happen in our schools. > War still does depend upon physical strength and endurance. Heavy weapons, ammunition and fellow soldiers might have to be carried distances, for example. >The Marines are especially active in getting them very young for recruiting. The Young Marines is a national non-profit 501c(3) youth education and service program for boys and girls, age eight through the completion of high school. 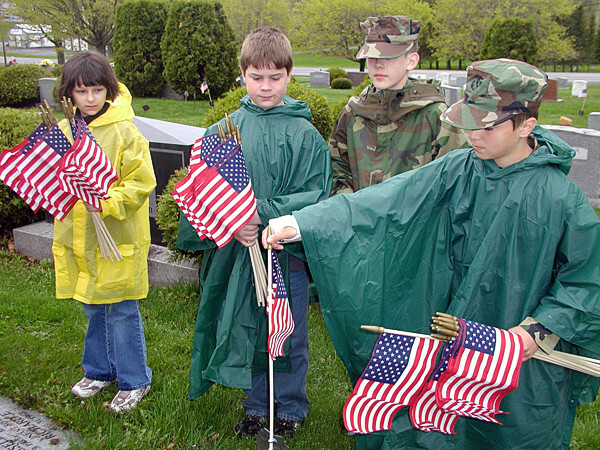 Young Marines do events like decorating graves with flags for Memorial Day as here which I believe is sick. > It’s too bad such displays of militarism with impressionable children at least can’t be balanced with peace studies, to include presentations from veterans against war: Vietnam Veterans Against War, Iraq Veterans Against War, Veterans For Peace, etc. Can this be the path they chose? How can those who serve inquire? To be drowned and born in fire? How we sing your praises high! Do they die for reasons known? Or for only pomp and show? ‘Till the last good soul goes free? Who says “he” and who says “she”? Help him! Help her! Help me! Please! Speaking of war and truth, saw a great movie last night: “Land of Mine.” It’s about German POWs who were required to clear land mines from Denmark when the war ended in 1945. Of the 2000 or so German soldiers who were tasked with this mission, about half of them were killed or injured. Many of those tasked were quite young, really in their late teens, just like those high school students doing pull ups for the Marines. The film is a perfect antidote to the “wonders” of military service and war. There’s one graphic scene of a young German maimed by a mine that is especially powerful. As my wife noted, we get to know this character before he’s maimed, and the maiming is shown in a way that few if any American films would ever show. Finally, this young man’s brother is haunted by this in a way that is entirely understandable, grim though it proves to be. Thanks to the greater and greater celebrity that the military enjoys, I have noticed that there is also a greater and greater disconnect between military personnel and civilians. I once got into an argument with a late friend and co-worker about the Second Ammendment, when I maintained that “no rebellion of armed citizens would stand a chance against the highly militarised police, much less the National Guard or the Army.” He fired back by telling me that he did not believe that US soldiers would ever unquestioningly turn their weapons on US citizens, and there would be mass defiance and desertion if ever such orders were given. That was certainly true at one time, but I do not believe it is anymore. The citizen-soldier, drafted to fight in a war and then discharged back into civilian life when the war is over, is a thing of the past. The introduction of celebrity to the US military via sports seems to be the most likely culprit for this phenomenon, as multi-millionaire professional athletes have absolutely no connection to their fans, and that’s what the military has turned into. Perhaps most still join today because they genuinely feel a need to serve their country, but a lot join for the freebies – free education, free training, free housing, free food, and preferential treatment when they get out, especially when they look for another job. On the subject of war movies, I would have to say my favourite (in terms of historical accuracy, though it isn’t “fun,” in fact it makes me cry) is Attack on Leningrad. It hardly depicts the soldiers at all, focusing instead on the deteriorating conditions in the city during the two-and-a-half-year siege. To quote Bronn from Game of Thrones, “it’s not the fighting that kills people, it’s the starving.” He also added “noble ladies sell their diamonds for a sack of potatoes,” something that was depicted in the film quite prominently. Americans have always had a disconnect from the true horrors of war; Russians, not so much. Yes, citizen-soldiers since the abolishment of the draft have been transformed into “warriors,” and the cost has gone up. In 1980, the annual cost of maintaining an American soldier hovered around $30,000; today that cost is $170,000 and growing. These expensive “warriors” wear their warrior-duds everywhere. I was in a major US airport recently, and these ragamuffins came by in their grubby cammy PJs which would have been forbidden before for citizen-soldiers, who always wore good-looking Class A uniforms in public. Even the generals who never ever get near any hostility wear their cammies for their photo-ops. The suicide rate of veterans is twice the national average. Kaja @ June 11, 2018 at 6:47 PM. I gather your friend ignored Kent State, Waco and the calling out of the guard and police during the 1960’s to “restore” law and order to the inner city. It was also necessary for the Chicago Police Department to shoot and kill ten unarmed demonstrators in Chicago, on May 30, 1937. The incident took place during the Little Steel strike in the United States. Nine people were permanently disabled and another 28 had serious head injuries from police clubbing. A Coroner’s Jury declared the killings to be “justifiable homicide”. 1. Rigid, unthinking adherence to conventional, middle-class ideas of right and wrong. 2. Respect for and submission to authority – parents, teachers, religion, bosses, or any leader. This includes a desire for a strong leader and for followers to revere the leader, following him (seldom her) blindly. There is an emphasis on following rules and regulations, on law and order. Everyone has a proper role to play, including gender role. 3. They take their anger out on someone safe. In an authoritarian environment (family, religion, school, peer group, government), the compliant, subservient, unquestioning follower stores up unexpressed anger at the authority. The hostility can’t be expressed towards the authority, however, so it is displaced to an outsider who is different – a scapegoat. 4. They can’t trust people. They believe “people who are different are no good.” Such a negative view of people leads to the conclusion that harsh laws and a strong police or army are necessary. 5. Because they feel weak, authoritarian personalities believe it is important to have a powerful leader and to be part of a powerful group. The successful, the powerful, the leaders are to be held in awe. 6. Over-simplified thinking. If our great leaders and our enormous government tells us what to do, if our God and our religion directs our lives, then we don’t have to take responsibility for thinking or deciding. We just do what we are told. 7. Guard against dangerous ideas. They believe an original thinker is dangerous; he/she will think differently. 9. Ethnocentrism: Everything of mine is better than yours – my country, my religion, my kind of people, my family, my self. Research has also shown the authoritarian is more prejudiced and more prone to punish people (including their own children) to get them to work harder or to do “right” (Byrne & Kelley, 1981). I was going to say the Elements of Authoritarianism is a thread in our American History, but it is more like a steel cable, which lurks in our society.